External Waterproof Braided Heavy Duty CAT5e Cable with Stranded Core for use in very demanding environments. External Waterproof Braided Heavy Duty CAT5e Cable with Stranded Core for use in very demanding environments. Used by the telecommunications companies for use on masts. 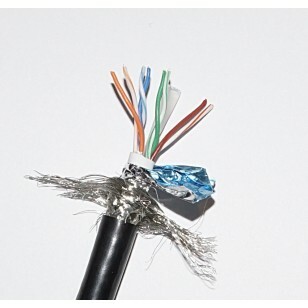 This cable can be used in ducts, along walls, overhead and up masts. Stranded inner core for extra resilience, more stable and flexible than solid copper core. Prefect for locations where there is lots of RF floating around and you want to minimise the chances of interference. Shielded braided CAT5e perfect for Ubiquiti radios such as Nanobeams, Rocket Dish, etc.